"The best spot to see the view of the beautiful Seattle skyline is Kerry Park." "Fun fact: Jose Rizal Bridge is named after a Filipino patriot Jose Rizal – Filipino pride! The best spots to see the view of the beautiful Seattle skyline is Jose Rizal Bridge and Kerry Park. I love going to these spots during the summer time and to catch the beautiful sunset. Seattle is known for Starbucks, being called the “rainy city,” Microsoft, and of course, coffee. Every time you turn around, you will either see a Starbucks or a small coffee shop. As much as I don’t mind Starbucks, I love supporting local businesses and trying their best coffee. My all-time favorite coffee shop is Moore Coffee located between Moore Theater and the Moore Hotel in 2nd Ave. They have the best coffee with delicious flavors such as the Nutella Mocha, Matcha Latte, and Taro Purple Latte. While drinking coffee, don’t forget to try their delicious waffles too. Also, while you’re in Seattle, don’t forget to visit the famous Pike Place Market! Don’t forget to try the Daily Dozen Doughnuts (who can say no to mini doughnuts?! Be sure to get assorted!) and take photos at the Gum Wall that’s located under the Market. Be sure to bring with you bubble gum to make your mark (Warning: It does get a little smelly at the alley so beware!). I also like going to the Seattle Waterfront, which is just below the Pike Place Market so the walk is not too far. It’s a great place to walk around and to check out the cute stores around. It is definitely worth the money to ride the Seattle Great Wheel and Wings Over Washington! 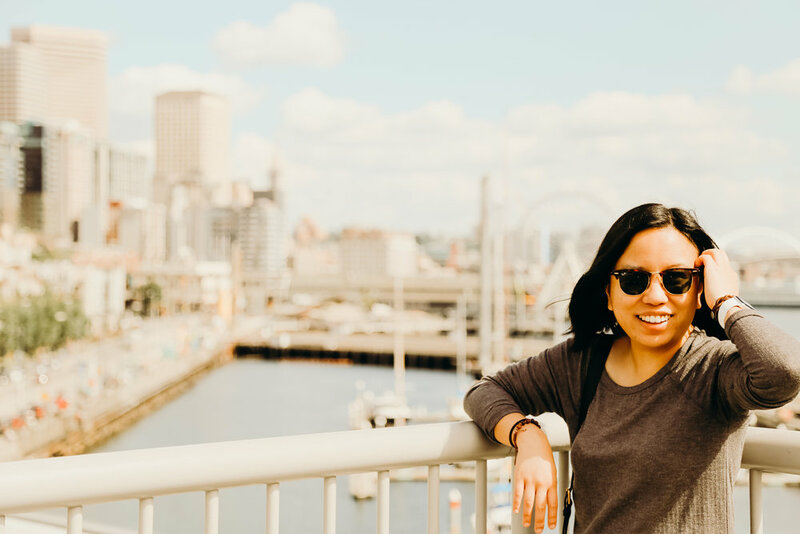 Alyssa is a sweet Seattle native, and we were so excited that she was willing to work with us to share some of her favorite spots! I definitely used her page as inspiration when I visited the Emerald City earlier this year. Follow along on her Instagram and Yelp for drool worthy food snaps!